Community-Based Fisheries Management (CBFM), gives coastal communities and fisherman primary responsibility for managing their costal resources (2). This form of management is more localized and, therefore, the management techniques can take many different forms depending on regional differences and the nuances of different fisheries. For this reason, CBFM is not defined by one approach or set of guidelines that dictate its implementation. Instead CBFM centers around the premise that community collaboration, and local participation can be an extremely productive and accurate means of managing, monitoring, and maintaining coastal resources (3). The basic principles, ethics, and ideas maintained by CBFM are universally applicable to many different situations. Fisheries are a basic and important economic resource in many areas. Like most all natural resources, general management methods must be applied to provide for the long-term interests of all groups of resource users/stakeholders, that might be affected by exploitation of the resource in addition to maintaining the resource itself. The task of managing fisheries is very complex; however, new strategies like Community-Based Fisheries Management (CBFM) which take a more regional and integrated management approach, can be more productive than past centralized management methods. CBFM achieves such productivity by combining scientific research with community involvement and Local Ecological Knowledge (LEK) to create monitoring programs specific to local areas. CBFM moves the focus of ocean resource management to individual areas/fishing communities, rather than managing fisheries on a coast wide scale. Currently fisheries are managed in many areas by a centralized or blanket method administered by a top-down approach from external managers. This approach has little involvement of the local people, that are most affected by the managed resource (3). By empowering local interests, as in CBFM, local relationships may be accentuated that larger scale management strategies might not include. In the U.S. management of fisheries historically has been very centralized, originating from larger state or government regulations which tend to control the amount of resource available for harvest by the user (2). These older management methods also predominantly focus on “single species modeling” while newer forms of management, such as CBFM, incorporate much more of an ecosystem based management approach. While CBFM focuses on giving primary responsibility to the local community, it is important to note that CBFM cannot take place in every scenario. It takes willingness, cooperation, involvement, and flexibility from community members to work together for the collective good. It is important that each stakeholder consider their decisions as they apply to the whole community and the health of the costal resources. This collective responsibility for the long term well being of the natural resources depends on a type of responsible self governance, dictated not by the achievement of maximum profits or harvest, but instead by promoting a stewardship and conservation ethic (2). CBFM seeks the conservation and preservation of ecosystem health, combined with the sustainable use of these local resources as seen fit by the community members. is a uniquely applied and flexible management strategy specific for most every situation. depends on open, ongoing communication within the whole community. utilizes the large knowledge base of fishermen who already have most of the tools for good local monitoring and research. requires patience, working toward long term rather than short term goals. removes the competitive spirit out of the fisheries and focuses the community on working for sustainability. Successful community based approaches to managing our natural resources have been around for quite some time. Even in aboriginal cultures there is most always some form of management system in place to prevent the historic “tragedy of the commons” scenario. These traditional management systems are culturally accepted and do not alienate the people that depend on that resource. In some cases these forms of management have even proven to benefit the ecosystems and provide sustainable resources for the community, preventing the depletion of a “common pool resource” (9). Fisheries are a classic example of the failure to have good management strategies for common resources, a tragedy of the commons scenario, because it involves harvesting a resource that has huge economic value. Overfishing is evidence of a few individual short term interests conflicting with the long term interests of the common good. Overfishing is also evidence for lack of good management. Since good management is dependent on good communication and shared information, it is critical to have that information available. In many situations good information cost money to collect, therefore, it makes sense that societies that can not or will not pay for that information will suffer from inherently poor management in those situations. Two case studies discussed later in this web site illustrate very successful community based management strategies. CBFM has become very popular in developing countries due to the need for protecting forests from large-scale forestry operations and traditional fishing grounds from industrial fishing vessels (2). Communities are organizing themselves to form larger organizations to manage local resources and fight for their collective rights. Figure . Fisherman with first harvest -photo by: ARC Centre of Excellence for Coral Reef Studies/Marine Photobank. All around the world communities are managing forests, watersheds, fisheries, and communal irrigation systems through a group of approaches called “community-based natural resource management” or CBNRM (2)." Protecting resources is not a new idea. It has been done for thousands of years, even in the marine environment. Today, however, with increased competition and pressure on dwindling resources, applying these ideas of community-based fisheries management to our oceans is considered a pioneering, innovative idea and has seen only limited use in a select few U.S. fishing communities. Fisheries are managed mainly at the national level by the National Oceanic and Atmospheric Administration’s National Marine Fisheries Service, also referred to as NMFS or NOAA fisheries. NOAA manages all U.S fisheries under the Magnuson-Steven Fishery Conservation and Management Act. This act was first set into place in 1976 in response to foreign dominated fishing in U.S waters. The U.S. wanted to bolster its domestic fishing fleet to take advantage of its offshore natural resources, but it first needed some legislative rules for management of this new resource. In order to exclude foreign vessels from the near shore fisheries, this act also established the Exclusive Economic Zone (EEZ), which stretches 200 nautical miles off shore. In initiating its domestic fishing fleet the U.S. government gave out large loans to fisherman, but as a result of this large overcapitalization in the fisheries, the government directly contributed to drastic overharvest and overfishing. This overharvest forced the reauthorization of the Magnuson-Stevens Act in 1996. In this reauthorization the act gained the addition of the “Conservation and Management” title and recognized the collapse of the Atlantic Cod fishery and the federal buy back from boat owners that followed that fisheries collapse. The act was again reauthorized in 2007. To help specify and focus management down to a regional scale, the Magnuson- Stevens act set up regional fisheries councils. The Pacific Fisheries Management Council includes Washington, Oregon, and California. The management of these regional councils encompasses all waters from 3mi offshore all the way to the extent of the Exclusive Economic Zone, and they manage everything from ground fish to salmon stocks. To be effective, however, management approaches need to be more specified and to have more local research, monitoring and involvement, consistent with the increase in popularity of CBFM. NOAA Fisheries management is based on maximum sustainable yield from the fishery, with possible modifications by any relevant, social, economic, or ecological factors (8). There are many factors that contribute to variability within this model. The systems are so complex that having enough data to manage fisheries with perfect certainty is nearly impossible. Even with knowledge about this variability, the use and practice of a general “precautionary principle”, to error on the low side of harvest quotas is very uncommon. The “ratchet effect” in which scientific models predict larger than normal recruitment rates or something indicating larger stock sizes so catch quotas are increased is a much more common practice, In these scenarios a ratchet down effect is never seen. Due to a combination of the practices mentioned above and the known variability of such systems, communities often experience overfishing. Specific aspects covering community based fisheries management activities are important when determining functions for management. Table 1 below, shows examples of such functions (boxed in red) and adjacent to these management functions are the parties who are generally responsible for them. "View fish harvesters as embedded in webs of relations, or ‘networks,’ that include not only the surrounding bio-physical environment, but also such things as management regulations, kinship ties, peer pressure, social support mechanisms, and the global seafood market (6)." Table  Examples of Management Functions currently shared between government and community. As modified from Community Fisheries Management Handbook. Community-based fisheries management is one alternative to both entirely centralized management, and to current trends towards management schemes like ITQ’s and Catchshare programs. The latter can allow for the possible privatization of a fishery and can also “squeeze small scale and part-time ﬁshermen out of the ﬁshery” (12). Exclusion of small fisherman could take place by an industry or individual purchasing large amounts of catch shares and consequently controlling a large portion of the total allowable catch. ECOSYSTEM BASED MANAGEMENT – This approachcenters management decisions around the larger idea of ecosystems and all of the components interacting to function as resilient andhealthy ecosystems. This management technique was recently adopted by the U.S National Ocean Council which was created by an executive order from President Obama in 2010. Many factors dictate the feasibility and productivity involved in integrating CBFM into specific communities. Some factors include: size of the population in that community, societal values, socioeconomic relations, scale of the fishing being done (industrial vs. inshore or artisanal fisheries), large economic incentives, different management techniques required for highly mobile species (9), limited funding for CBFM organizations, and governmental willingness in allowing more control to come from communities. All off these factors and many more can affect whether an idea for CBFM even gets off the ground. Dr. Juan Carlos Castilla is an important name in the scientific community, due to his level of experience in marine special planning, ecosystem ecology, fisheries rights, as well as management cooperatives. He has spearheaded numerous research and monitoring projects in Chile. Over the years his team has focused on documenting ongoing trends in the populations of Chilean abalone (Concholepas concholepas), sea urchins, and keyhole limpets as numbers rise, plateau and fall (11). The city of Port Orford is an excellent example showing that CBFM works; that community effort, along with a dedication to main access to natural resources can result in sustainable exploitation of the marine resources. CBFM such as that taking place in Port Orford not only has the potential to create more jobs for communities, but it can also help community members feel innately connected to their environment and that resource through local participation. Given the fact that our marine biome makes up over 70 percent of our planet, it seems odd that governmental agencies might hesitate to spend money, allocate resources, or even entertain simple ideas that could change the way we manage our oceans. We all must be critical thinkers in how we go about our daily choices and decisions. Practices and choices by seafood consumers can have a huge impact. In the end consumers contribute largely to how their seafood was caught, and the sustainable management practices that went into harvesting that dinner. It is also important that we continue to be critical thinkers as we make more complex decisions for future exploitation of natural resources in our oceans. The accumulation of programs, organizations, and CBNRM projects exhibited in these case studies can create larger movements of social change, rooted in each and every community and community member who can now feel an invested interest in their area. Whether it be through the community monitoring programs, outreach events, participation in the council, or some other involvement, community based management strategies like CBFM are important in connecting people in all communities to their environment. Enforcement is hard in most scenarios but community management also engages neighbor to neighbor regulation and an ethic and value system which proliferates through generations. Marine reserves become become seen as stewardship research areas and enforcement is seen as your neighbors. In essence simple changes like this are what drive such local scale involvement and ultimately contribute to productive management techniques like CBFM. “1. Strategies for the RFMCs to involve fishing communities at an early stage in the decision-making process to determine if catch shares and/or community associations are appropriate and ensure that the diverse needs of different communities are addressed. 2. Suggested approaches for the development of community associations or other mechanisms to retain local jobs and fishing heritage in traditional fishing-dependent communities. 3. 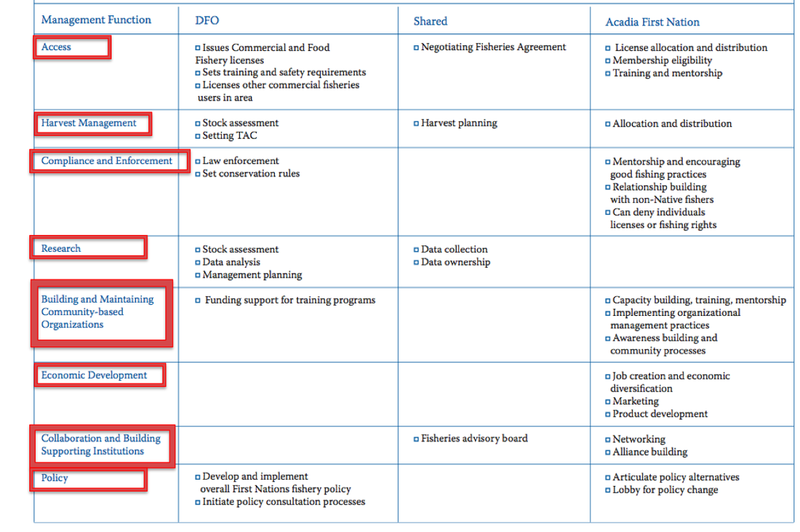 Mechanisms for monitoring the economic and environmental impacts of catch shares following their implementation, so that best practices can be identified and adjustments can be made as needed. NOAA’s National Marine Fisheries Service (NMFS) represents the national level for most all of fisheries management within the United States. It might seem like such a management system would be too disconnected from the local communities. The argument from many smaller inshore fishing communities is that this is a less productive way to manage fisheries which can be so different from area to area. However NOAA works very hard to breach that disconnect. With the help of Regional Management Councils, NOAA can gain more insight on gear modifications, managing techniques, and perspectives from the community. Above pictures link to some recent examples illustrating how NOAA fisheries is striving to reach out and implement management designs specific to local areas. Stocks - the fish of a certain species located in a specific ocean area. Stakeholders - people, groups of people that are affected by the management of natural resources concerning them. photo by: ARC Centre of Excellence for Coral Reef Studies/Marine Photobank".
. - Modified from: Graham J., Anthony Charles and Arthur Bull. 2006.Community fisheries managementhand book. Gorsebrook Research Institute, Saint Mary’s University. <http://www.unuftp.is/proj01/BulayiPRF.pdf> Ministry of Natural Resources and Tourism, Fisheries Division, Tanzania. Graham J., Anthony Charles and Arthur Bull. 2006.Community fisheries management hand book. Gorsebrook Research Institute, Saint Mary’s University. K. St. Martin, B. McCay, G. Murray, T. Johnson and B. Oles. 2007. Communities, knowledge, and fisheries of the future. International Journal of Global Environmental Issues. 7 2/3 pp. 221–239. Castilla J.C. and S. Gelcich. 2008. Management of the loco (Concholepas concholepas) as a driver for self-governance of small-scale benthic fisheries in Chile. Bulletin Of Marine Science. 86 (2) Pages 441–451 in R.